Welcome to Thinking Out Loud Thursday! Thanks for stopping by. Hope you link up with me and Vanessa from X-tremely V below and share what you're thinking out loud about today. So it's kind of a thing with me to check out the National Calendar Day website and see what celebrations are going on because, you know, every day should be a party about something! Well, today happens to be National Hydration Day. Appropriately placed on the calendar since here in the Midwest we are experiencing temps peaking around 100 degrees and it's pretty easy to become dehydrated. Staying hydrated in the summer isn't always easy. Wondering how much water you should drink in a day? Well, according to WebMD: "It depends on your size and weight, and also on your activity level and where you live. In general, you should try to drink between half an ounce and an ounce of water for each pound you weigh, every day. For example, if you weigh 150 pounds, that would be 75 to 150 ounces of water a day. If you're living in a hot climate and exercising a lot, you'd be on the higher end of that range; if you're in a cooler climate and mostly sedentary, you'd need less." To be honest, I'm not a fan of water. I know, I know - how can you NOT like water?!? It just tastes like nothing to me. So this year I invested in the Infusion Water Bottle from Pampered Chef. 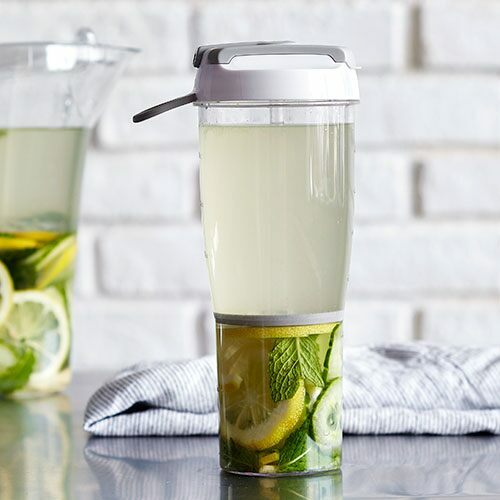 This handy 24 ounce bottle lets you infuse your favorite fruits and vegetables for some awesome tasting water. The measurement marks on the side help you keep track of your intake. The shape also fits in most car's cup holders so you can take it with you when you're on the go. It's also BPA-free and dishwasher safe. Love it!! Click HERE if you need one for yourself! Check out this handy chart that gives you some great combination ideas. The Pampered Chef Infusion Water Bottle has a cool strainer that keeps your combinations in the bottle and not going in your mouth when you drink. So cheers for water today! Drink up and stay hydrated! So that's what I'm thinking out loud about today. What about you? What's on your mind? Link up your blog post below and let us know! See you tomorrow for my Five on Friday. This post contained affiliate links. I may receive a small commission if you click on the link and purchase. Thanks! Great tip! Plain water gets really boring for me too. I need to get one of these bottles, and those recipes are awesome! I love adding fruit to my water. I have a peppermint indoor plant and often put peppermint in water with lemon. Strawberries and lime are also delicious! The national Calendar day seems so fun. What a great way to plan desserts or fun dinners. Thanks for the linkup and have a good weekend! I enjoy fruit-infused water. It does help get the amount we need down. If you space it out during the course of the day and choose it over say soft-drinks, it does get easier. I love those infused water ideas! I'm trying to drink more water but I really need to get more disciplined with it! I've got to try some of these combinations! Thinking Out Loud Thursday - Blog is 2!